Haskell code is expressive. The HLearn library uses 6 lines of Haskell to define a function for training a Bayesian classifier; the equivalent code in the Weka library uses over 100 lines of Java. That’s a big difference! In this post, we’ll look at the actual code and see why the Haskell is so much more concise. The first two lines define the Bayes data type as a wrapper around a distribution. The fourth line says that we’re implementing the Bayesian classifier using the HomTrainer type class. We do this because the Haskell compiler automatically generates a parallel batch training function, an online training function, and a fast cross-validation function for all HomTrainer instances. The fifth line says that our data points have the same type as the underlying distribution. The sixth line says that in order to train, just train the corresponding distribution. We only get the benefits of the HomTrainer type class because the bayesian classifier is a monoid. But we didn’t even have to specify what the monoid instance for bayesian classifiers looks like! In this case, it’s automatically derived from the monoid instances for the base distributions using a language extension called GeneralizedNewtypeDeriving. For examples of these monoid structures, check out the algebraic structure of the normal and categorical distributions, or more complex distributions using Markov networks. In Weka we must separately define the online and batch trainers, whereas Haskell derived these for us automatically. 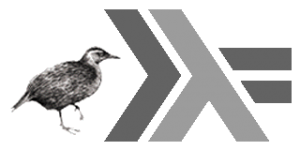 Weka must perform a variety of error handling that Haskell’s type system takes care of in HLearn. The Weka code is tightly coupled to the underlying probability distribution, whereas the Haskell code was generic enough to handle any distribution. This means that while Weka must make the “naive bayes assumption” that all attributes are independent of each other, HLearn can support any dependence structure. Weka’s code is made more verbose by for loops and if statements that aren’t necessary for HLearn. The Java code requires extensive comments to maintain readability, but the Haskell code is simple enough to be self-documenting (at least once you know how to read Haskell). Weka does not have parallel training, fast cross-validation, data point subtraction, or weighted data points, but HLearn does. * Updates the classifier with the given instance. Every algorithm implemented in HLearn uses similarly concise code. I invite you to browse the repository and see for yourself. The most complicated algorithm is for Markov chains which use only 6 lines for training, and about 20 for defining the Monoid. You can expect lots of tutorials on how to incorporate the HLearn library into Haskell programs over the next few months.